Looks like FFXI is far from dead. Last week, an update went live on the Test Server that allowed players to change the width and line height of the chat log. Since then, players have been asking about other changes that may come about as a result of this latest adjustment to the user interface. Hiromichi Tanaka has replied on the forums answering some of the questions players have had. While switching out some of the current window backgrounds is a welcome change, there’s one that would be even more welcome: A completely revamped UI that eliminates current limitations that the development team is facing. One example given is the ability to have multiple chat windows, but perhaps past limitations such as a mini-map would be possible under this new system. As we are working within the limitations of the current UI, we are a bit limited with the things we can do. While we are working on things that we can, like the Windows version resolution improvements, we have actually begun looking into completely revamping the entire UI. Of course this is going to take some time, so once I have more information, I will be sure to share it with you. For our next step, we are planning to address higher resolution text fonts and separate resolution settings for the overlay graphics resolution and menus. After all these resolution changes and a revamp of the user interface, what else would be left to update to help this game stay current with this generation of MMOs? We already know that the opening cinematic has been redone in a higher quality. Could updated textures for an HD version of Final Fantasy XI actually be in the works? Let us know what you think in the forums! Derz does this mean you are back? Yep I see derz and amone on mostly everyday. And I've been playing more again myself when time allows. Well, I broke my diet and have started eating cupcakes today. I think I am back in gaming form. Je tiens à gratter que démangeaisons pour vous zeek... Vraiment je ne!! I hope Amone took care of that itch, I find scratching helps. Just did my first Grounds of Valor alliance exp party and it levels you quickly. 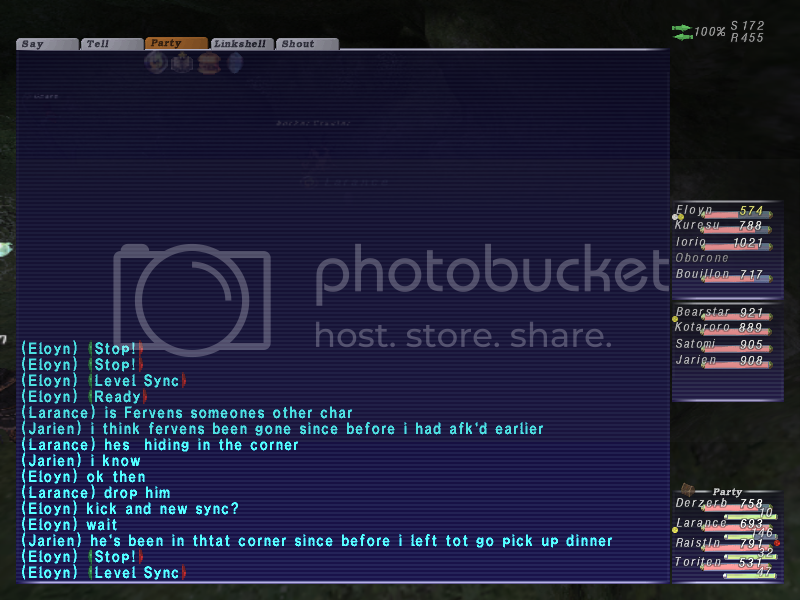 From what ls mates tell me, its the new agreed way of leveling before Abyssea ( abyssea they tell me is 70+). Basically it's like Fields of Valor except it takes place in dungeons AND as long as you don't zone, the bonus exp you get after completing a page becomes higher. So lets say an alliance of 18 people all level sync and do page 1. As long as the mob cons easy prey or above, they will get credit for the kill and get the bonus after completing the page. (in this case you set the page 1 to auto-renew, so you don't have to return to the book thing). So you have this alliance wailing on easy prey/decent challenge and getting like 12 exp per kill, but the bonus is like 1k and after every successful page completion that 1k reward gets higher maybe reaching 2k+. If your alliance completes a page in about 5 min then thats 1-2k+ in 5 min >.>. (They also changed the repop times of the mobs to a low number, like 5 min, so there's not much waiting if at all). Think I spent this afternoon until night on warrior level 44 - 59 and only left because I wanted to give some people waiting my spot. Denruki told me that Gusgen Mines and Crawler's Nest were the two heavy spots for this. Though I have done it with a smaller party in Maze of Shakrami. It may seem like SE killed gameplay at first glance, but I do like it in that if you have to go, theres no pressure to wait it out to look for a replacement. No one will miss you if you are fighting Easy Prey/ Decent Challenge with 10+ people. ;>_> also gives you more leeway with subs you can use and stuff in general. Also Square has made it clear that they want people to spend less time leveling and more time actually playing the game since theres so much content. 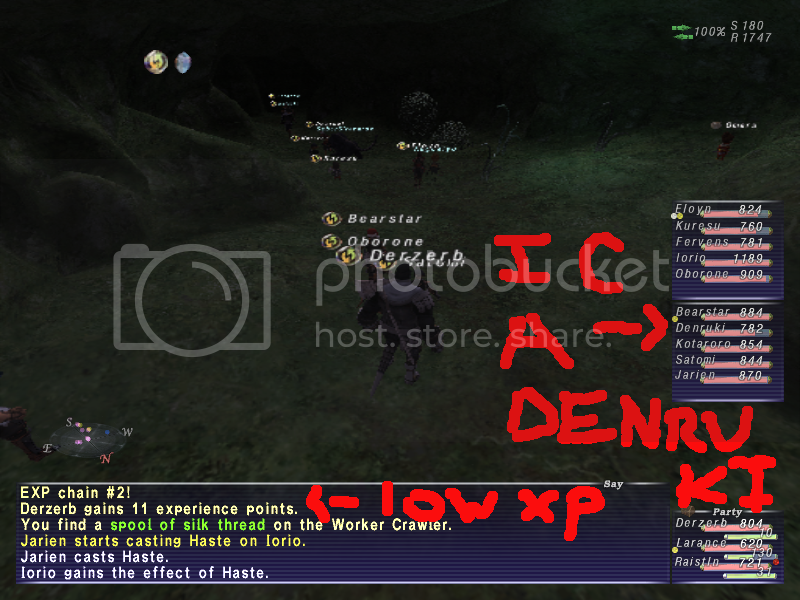 Denruki invites me to his Ground of Valor party and as you can see the exp per mob isnt high at all. There are still taboos that players will perform though, like this taru who was in alliance and went afk behind a rock so no one would see him and leeched exp. oh suuure... NOW you come back! what do I have like 3 weeks of patches to download..
Might as well check it, not like I'm playing skyrim anyways, friggin bugged/freezing piece of garbage. Tanaka is at the helm again. I thought he got canned for running FFXIV off a cliff. Damn stupid asian mentalities.